It all began with a licensing inquiry for a sister funk cut which we wanted to include on our deep funk comp titled "Feeling Nice Vol. 3". 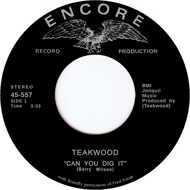 After the deal was completed producer Fred Forsh mentioned that the backing band of Nadine Brown's masterpiece "Leave Me Alone" had released a 45 themselves under their name Teakwood. After Mr. Forsh played us both sides we knew that this 45 would have to be re-issued. What was about to follow nobody of us ever expected. Mr. Forsh told us that Teakwood recorded almost a dozen of songs which were supposed to be released on a full length album. Forunspecified reasons the album was never released and it remained in the can for almost 40 years. Finally, we are very proud to announce the release of Teakwood's debut album "A Distant Star" in early 2017. Until then you have to be content with this 45 rpm single re-issue.